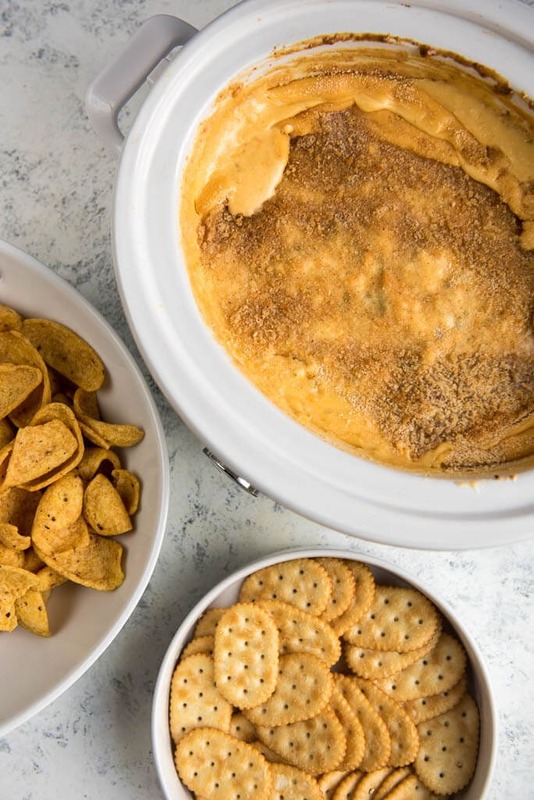 Slow Cooker Jalapeño Dip is a simple way to make your favorite appetizer without all the fuss. Delicious peppers, sweet jam and cream cheese perfect for dipping your favorite chip. 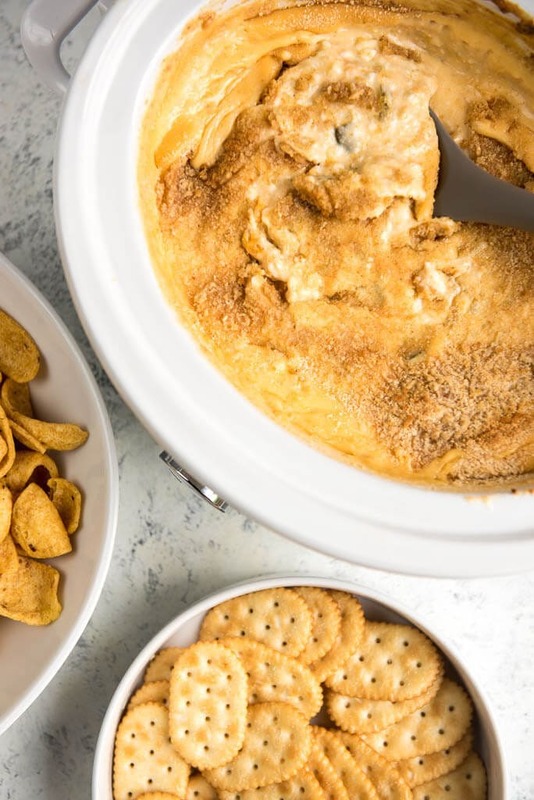 No matter if it’s sweet summertime, football season, or the dead of winter, appetizers are always in season! 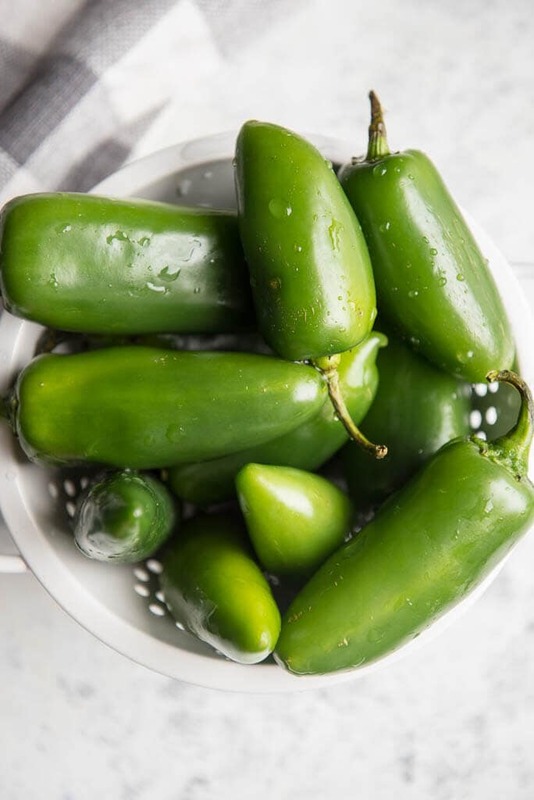 And if you are entertaining at home or looking for a dish to share I’ve got one today that’s sure to disappear in no time and result in request for you to bring it to the next gathering, Slow Cooker Jalapeño Popper Dip! Why bother with stuffing, wrapping and grilling or baking peppers when you can just throw all the ingredients into the slow cooker instead? 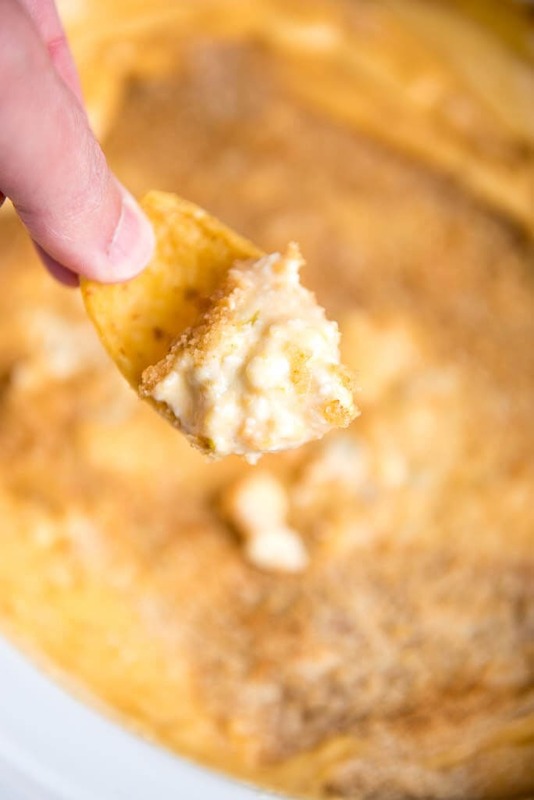 This dip is inspired by my favorite jalapeño popper recipe but is so much easier to make and has been a hit every single time I’ve made it. “Pro” tip…. when you dice up jalapeños, wear some gloves! Yes, I know this from experience after having my hands burn for days. And this takes about 1/2 pound of peppers so you will be dicing for awhile. I actually cheat a bit and use my mini-chopper, but it still involves removing the ribs and seeds first. Speaking of prepping the peppers, I remove every single bit of ribs and seeds so that the dip will not be spicy. When serving to a crowd, I always err on the side of caution, or in the case, the assumption that most people do not like things too spicy. Obviously, you know the crowd you will be serving to, so adjust this as needed. One other tip, I love making this in my mini-casserole slow cooker. 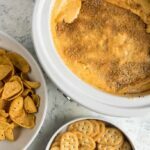 This is my new favorite slow cooker for dips, appetizers and smaller meals, so if you don’t have one yet I recommend considering adding this to your line-up for it’s versatility. 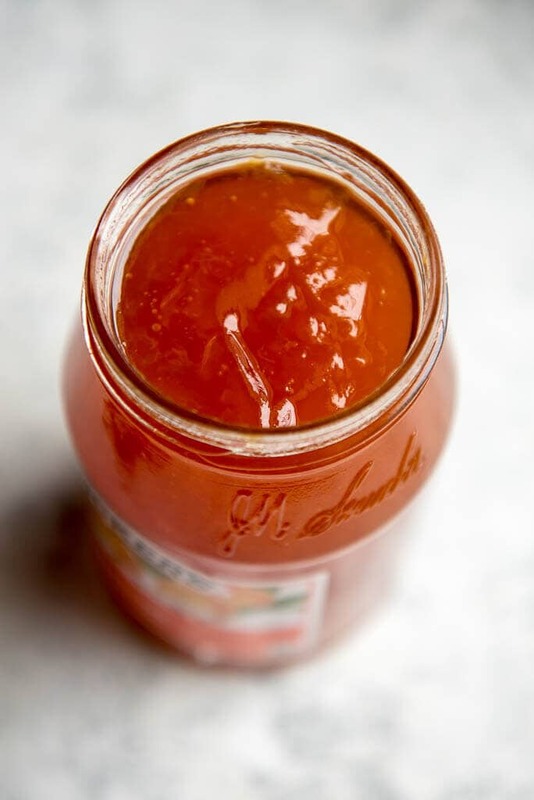 My favorite “secret ingredient” to use is apricot preserves. You can use the no sugar added version or the regular, whichever you prefer. I just love the contrast of sweet and spicy and think it’s just as perfect for the dip as it is for the whole popper version. The thing I do leave out here is the prosciutto, but if you wanted to you could sauté a little up and add it as a topping to give you the salty contrast as well. 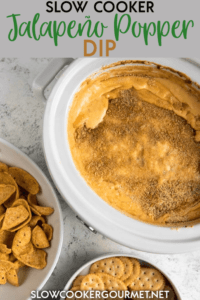 You will certainly need some scoopable style chips to serve with this and can add some sturdy crackers and veggies as you see fit. I mean, if you eat this dip with celery, then it will certainly make it healthy, right? In the end I top it all off with a few breadcrumbs and pop it in the oven for a bit, but this step is totally optional. 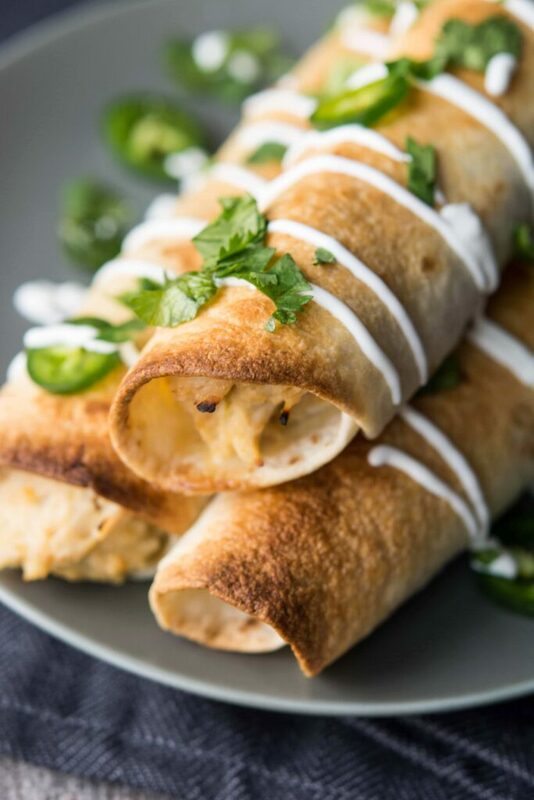 If you happen to love jalapeño poppers as much as we do, here are a few other takes on the jalapeño popper, reimagined into new recipes you must try! 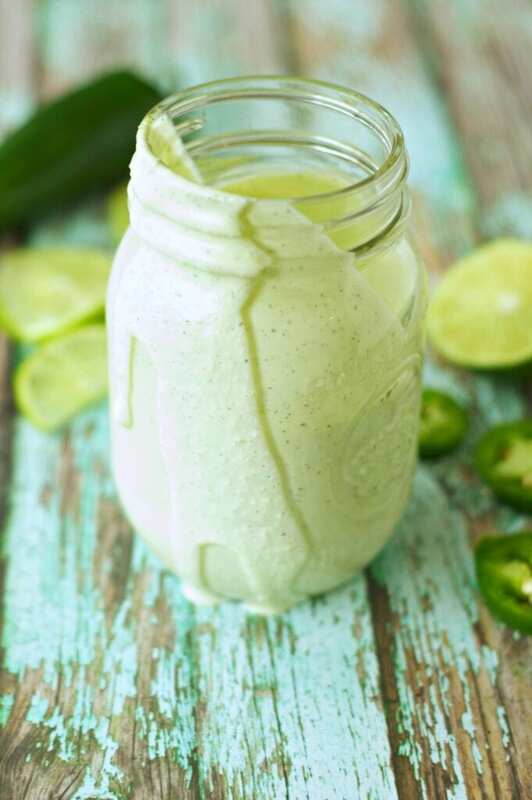 Craving more jalapeño recipes? I’ve got plenty! Like….